Tacton CPQ is an easy-to-use, web-based Configure, Price, Quote (CPQ) solution. The platform is built on a powerful, constraints-based configurator that enables it to handle the most complex product structures. It streamlines and automates CPQ processes making it easy for businesses to manufacture, deliver, sell, and service customized products. The application is put together to help sales channels quote more accurately, speed the time to delivery, and close more deals faster. Tacton CPQ identifies your customer’s genuine business needs before translating them into optimal product offering. It empowers your sales reps to respond promptly to customer requests with the most competitive and up-to-date product. This enables you to strengthen your brand, increase revenue, reduce risk, and cost even in the most challenging configuration environment. Its core solutions includes: CPQ, product configurations, design automation, and 3D visualizations. One likable feature of Tacton CPQ is the powerful constraints-based configuration engine. This engine drives constraints-based configuration which translates to fewer rules. It handles even the most challenging configuration environment to identify solutions that best satisfy the needs of a specific customer. It authenticates the entire solution scope for each customer selection to deliver accurate solutions right from the bill-of-material (BOM) level. Tactons CPQ performs beyond guided selling to power need-based configuration and selling. It enables businesses to perform a selling that is tailored to their customers’ needs. The application makes it easy for sales teams to direct customers to the right product based on factors that matter most to them. Whether its price, running cost, energy efficiency, intended use, or other preference, the platform take into account all the specific customer’s need to suggest the right product. 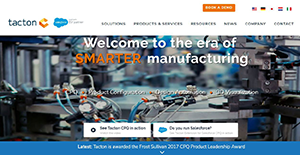 Tacton CPQ also eliminates order errors and automates quotation process to increase efficiency. This helps not only sales teams, channel partners, and dealers to produce accurate quotes but also the customers to shop confidently. Tacton CPQ is easy to use and can run online or offline. The platform ensures a seamless connection between sales and manufacturing to eliminate the error-prone data handover and maintain workable sync. It also supports easy integration with robust CRM, ERP, and PLM APIs to expedite data exchange. It provides an Extension that supports Salesforce CPQ with robust services. This Tacton Extension enables sales teams to configure and generate high-quality quotes, 3D drawings, technical documentation, BOM and pricing within the Salesforce environment they are accustomed to. If you are considering Tacton CPQ it might also be sensible to examine other subcategories of Best CPQ Software collected in our database of SaaS software reviews. It's essential to realize that hardly any service in the CPQ Software category will be an ideal solution able to fulfill all the requirements of all business types, sizes and industries. It may be a good idea to read a few Tacton CPQ reviews first as some solutions might perform well just in a very small group of applications or be prepared with a very specific industry in mind. Others may function with an intention of being simple and intuitive and as a result lack complex functions welcomed by more experienced users. You can also find services that cater to a large group of customers and offer a rich feature base, but this frequently comes at a higher price of such a software. Ensure you're aware of your needs so that you choose a solution that offers all the functionalities you look for. How Much Does Tacton CPQ Cost? We realize that when you make a decision to buy CPQ Software it’s important not only to see how experts evaluate it in their reviews, but also to find out if the real people and companies that buy it are actually satisfied with the product. That’s why we’ve created our behavior-based Customer Satisfaction Algorithm™ that gathers customer reviews, comments and Tacton CPQ reviews across a wide range of social media sites. The data is then presented in an easy to digest form showing how many people had positive and negative experience with Tacton CPQ. With that information at hand you should be equipped to make an informed buying decision that you won’t regret. What are Tacton CPQ pricing details? What integrations are available for Tacton CPQ? If you need more information about Tacton CPQ or you simply have a question let us know what you need and we’ll forward your request directly to the vendor.